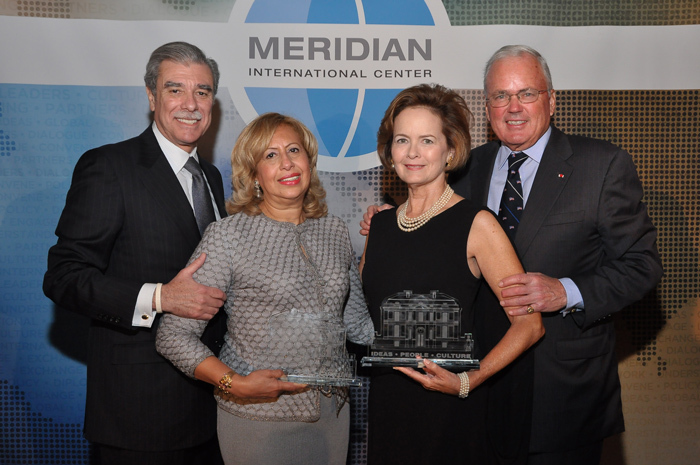 On September 13, 2012, Meridian International Center awarded two exemplary leaders for their contributions to the international community at the Meridian Global Leadership Awards Dinner in New York City. 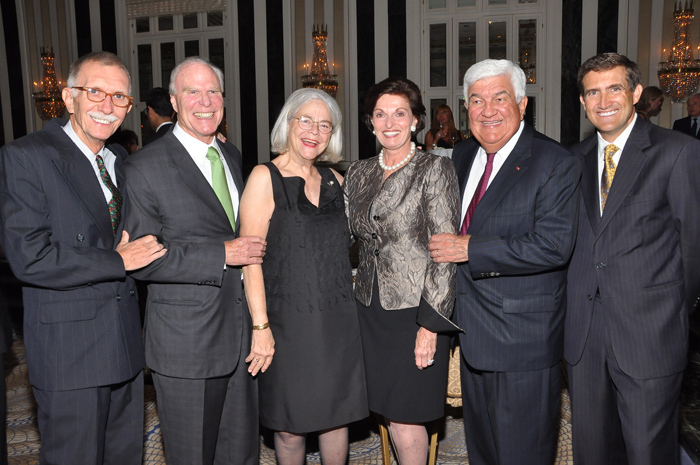 Held at The Waldorf=Astoria hotel, the dinner was presided over by Honorary Chairman, President George H. W. Bush; Dinner Chairman, Ambassador Thomas C. Foley; and Vice Chairmen, Under Secretary Christopher B. Burnham and Ambassador Charles L. Glazer, Leon Kalvaria, Secretary Ann McLaughlin Korologos, and Ambassador Tom C. Korologos. 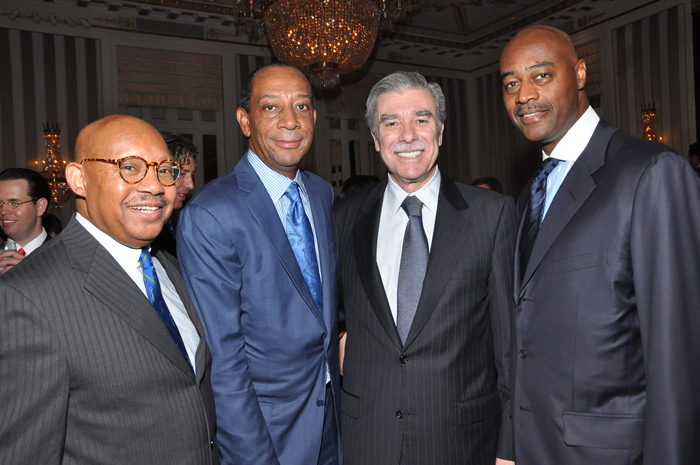 Lead sponsors included Thomas C. Israel of Ingleside Investors and Gordon Gund of Gund Investment Corporation, along with corporate benefactors, Citigroup, Inc., JP Morgan Chase, Bloomberg, Moët Hennessy, and Abercrombie & Fitch Co.
Secretary Carlos M. Gutierrez, former President and CEO of Kellogg Company and 35th Secretary of the U.S. Department of Commerce, received the Meridian Corporate Leader Award for promoting American business in the U.S. and abroad, and helping lead the passage of CAFTA-DR to expand export opportunities and cross-border trade and development. Ambassador Craig R. Stapleton, Senior Advisor to Stone Point Capital in Greenwich, Connecticut and former Ambassador to France and the Czech Republic, received the Meridian Global Citizen Award for playing an instrumental role in ensuring that key bilateral and multilateral issues were addressed through open dialogue across borders. Following a 6:30pm cocktail reception, the evening commenced with opening remarks given by Dinner Chairman Ambassador Thomas Foley, who highlighted the awardees’ lives and careers as "impressive examples of the positive impact individual and corporate leaders can have in creating stronger ties and greater understanding between the U.S. and foreign nations." Following dinner, Ambassador Korologos and Ambassador Foley then each introduced Secretary Gutierrez and Ambassador Stapleton prior to the presentation of their respective awards. 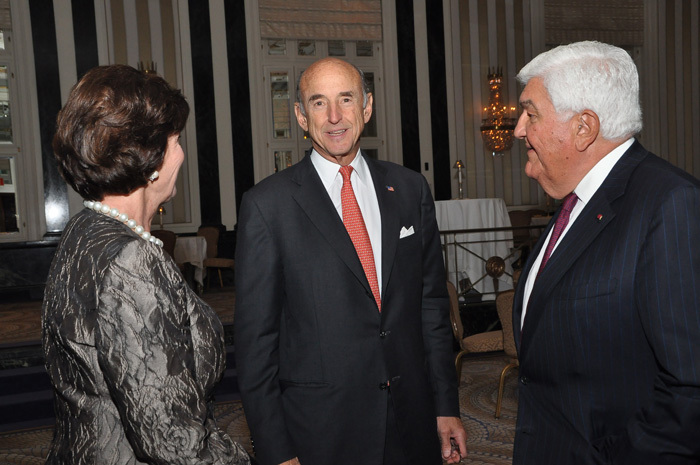 Ambassador Korologos summarized that "Carlos’s life is a wonderful example of the American Dream come true with his evolution from immigrant to Chairman and CEO of Kellogg Company and the 35th Secretary of Commerce." 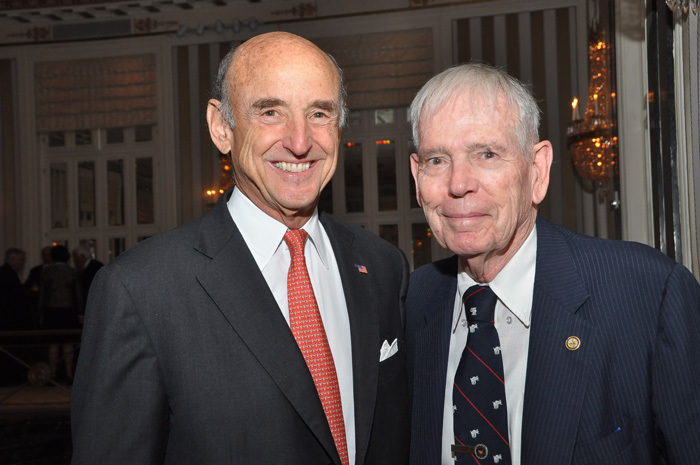 Ambassador Foley, good friend to Ambassador Stapleton, congratulated him for "his exceptional commitment to improving relations between nations." Guests also enjoyed videos which expanded upon the honorees’ lives and many accomplishments. The honorees join other distinguished leaders who have previously received Meridian Awards, including Ambassador Elizabeth Frawley Bagley, Special Representative for Global Partnerships, U.S. Department of State; Ambassador Melanne Verveer, Ambassador-at-Large for Global Women’s Issues, U.S. Department of State; Ambassador Nancy Brinker, Founder and CEO of Susan G. Komen for the Cure; Ambassador Tom Korologos, Strategic Advisor, DLA Piper; Secretary Ann McLaughlin Korologos, Former U.S. Secretary of Labor; and Jim Clifton, Chairman and CEO of Gallup. 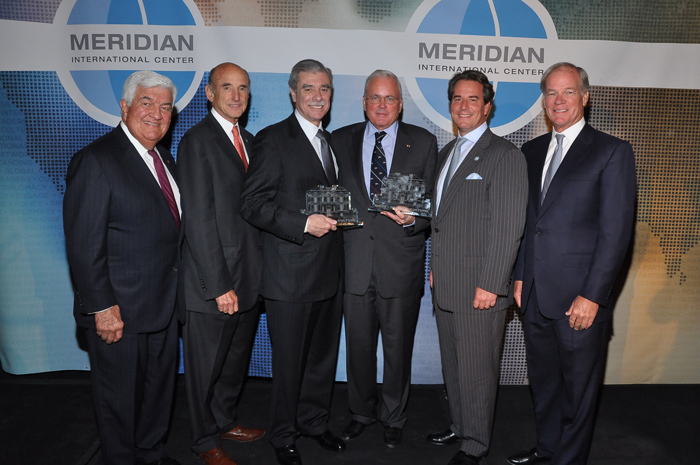 The Honorees and Chairmen of the 2012 Meridian Global Leadership Awards in New York.